Every year, I host a Mothers Day portrait session for my clients. I think there’s nothing better then making sure in 20 years your children have a portrait with YOU to hold onto. 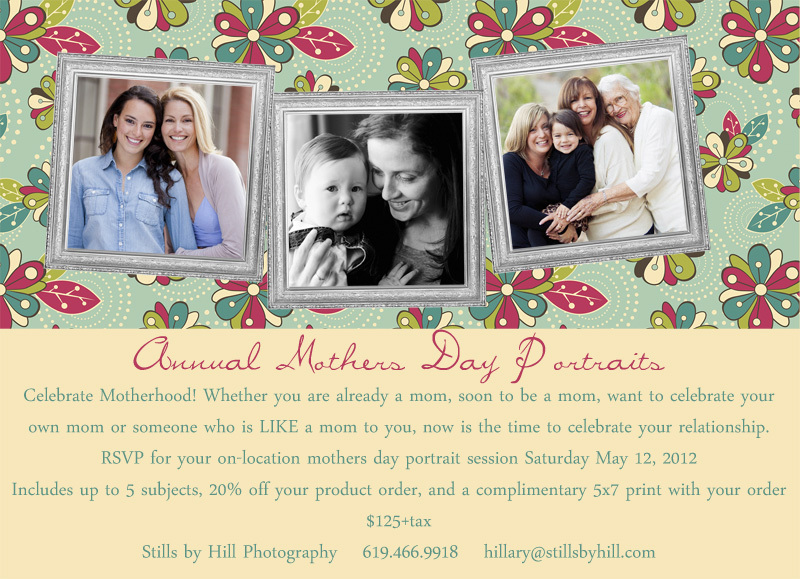 These sessions can be for a generational portrait, a mom with her family, a maternity portrait, someone who is like your mother etc. Celebrate the relationships that are important to you. Sessions will be on-location in San Diego on Saturday, May 12th, 2012. If the weather doesn’t cooperate, I will change the location to be indoor studio studio shots. Sessions include up to 5 subjects, about 20 minutes of shooting, and online ordering. You also will receive 15% off prints and products (I will email you a product price list once you contact me–it’s my regular portrait session price list) and also a 5×7 art print with any product order. Anything you order will also go online digitally so you can share on facebook & your social media sites. You can click HEREto reserve your spot. You can also share this event on facebookby clicking “like” below the post and sharing. Thank you! I just love your Mother’s Day portraits. I wish I lived closer so I could take advantage of the amazing promotion! OMG I’d be all over this if I wasn’t planning on doing minis that day too!! Moms totally get the short end of the stick with pictures (among other things!!). I love your ad, it’s sooo pretty. I can’t wait for you to post the images! !